If you are a tenant displaced because of a fire in your building, it is important to know your rights about relocation, personal injury, property damage, and potentially holding the landlord and/or third parties liable for the damages you have suffered. Below is some information that will be useful to fire victims in San Francisco rent-controlled apartment buildings. For more advice and a confidential consultation with one of our experienced tenant and fire litigation attorneys specific to your situation, call Bracamontes & Vlasak today at 415.835.6777. It is important if you have relocated to notify the landlord in writing of your new address and contact information, stating that you are doing so for purposes of the landlord keeping you informed of the status of repairs to the building, your right to reoccupy, and recovery for your losses. Keep a copy of this letter. Failure to notify the landlord in writing of your new address may waive certain rights you may have. If you can do without the deposit, however, and intend on moving back in if and when you can, let the landlord keep the deposit for now. Under Section 12.19 of the San Francisco Rent Ordinance, if a tenant is forced to vacate his or her unit due to fire, within 30 days of the completion of repairs to the unit, the landlord must re-offer the unit to that tenant under the same terms and conditions as existed prior to his/her displacement. From the date the tenant is notified of his right to reoccupy, he has 30 days to notify the landlord of his acceptance or rejection of the offer. If the tenant accepts, the tenant must reoccupy the unit within 45 days of the receipt of the original offer from the landlord. However, the cost of capital improvements which are necessary before re-renting a unit damaged by fire, if not reimbursed by insurance proceeds or by any other means, may be passed through to the tenant by utilization of the capital improvement petition process (per Chapter 37.7 of SFRO). Landlords may petition for exemption from the Rent Ordinance because of substantial rehabilitation of a building. “Substantial rehabilitation” means the renovation, alteration or remodeling of a building containing essentially uninhabitable residential rental units of 50 or more years of age that require substantial renovation in order to conform to contemporary standards for decent, safe and sanitary housing. Improvements will not be deemed substantial unless the cost of the work for which the landlord has not been compensated by insurance proceeds equals or exceeds 75 percent of the cost of newly constructed residential buildings of the same number of units and type of construction, excluding land costs and architectural/engineering fees. Tenants may raise objections to the Substantial Rehabilitation Petition based upon any of the following: that the work was not done; that the work was necessitated by the current landlord’s deferred maintenance resulting in a code violation; that the costs are unreasonable; and/or that the work was not principally directed to code compliance. Under the Good Samaritan provision of the San Francisco Rent Ordinance, a tenant displaced by fire can rent a temporary replacement unit at a reduced rent rate using the Good Samaritan Status in SFRO Section 37.2(a)(1)(D). Reduced rent rate means the base rent the tenant was paying for the previous unit at the time of the fire, or an amount up to 10 percent above that amount. However, if the tenant enters into a new rental agreement for a different apartment with the same landlord who owned the fire-damaged building, then the rental rate must be the same amount that tenant was paying in his previous unit at the time of the fire. A tenant’s right to reoccupy his former rent controlled unit that was damaged in the fire is not affected by using the Good Samaritan Status. To qualify for such reduced rent in a new apartment, the tenant must get a written certification from the Fire Chief, Director of the Department of Building Inspection, or Director of Public Health, stating that, as a matter of public health and safety and as a matter of habitability, the tenant cannot and should not reside in the affected rental unit until it has been appropriately repaired. At Bracamontes & Vlasak, we have substantial experience representing victims of fires in all stages, including relocation, cause and origin investigation, litigation, and tenants’ rights to re-occupy buildings once repairs are made. 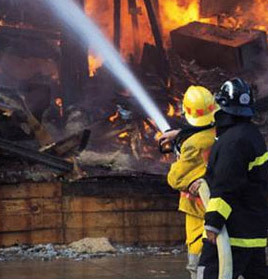 Call an attorney at BV Law today for a free consultation about your fire case at 415.835.6777. You can also Contact us online. See also our Landlord-tenant and personal injury practice pages for more information.